1. Start on time. Beginning promptly shows you respect people’s time and encourages punctuality as an aspect of your organizational culture. Train and encourage meeting leaders to adhere to firm start times. Managers should address chronic latecomers verbally first (but after the meeting), and in writing later if necessary. 2. Lead with something positive. Poorly run meetings can quickly devolve into unproductive gripe sessions. Set the tone for a more constructive discussion of your agenda items by leading off with some good news highlighting an organizational or individual accomplishment. 3. Clear the air. After a positive start, if there’s an “elephant in the room,” confront it. Examples include a sudden staff change, bad sales report or unflattering story in the media. Say whatever needs to be said to acknowledge it and, if appropriate, discuss it. Then move on to a more constructive topic. 4. Deploy multiple voices. 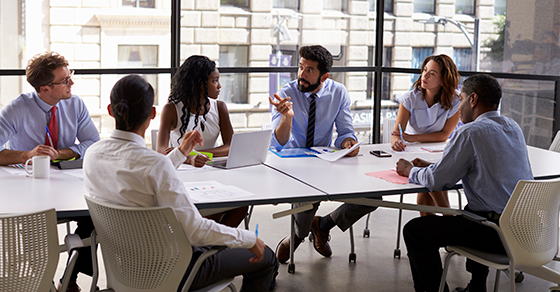 Depending on the agenda and meeting length, it’s usually a good idea to ask more than one team member to address a topic and lead a discussion. This will give the meeting more of a dynamic feel — lessening the likelihood that attendees will tune out a single voice. It also eases the burden on one person to run the whole show. 5. Follow a “no rehash” rule. Every topic should be thoroughly discussed. But backtracking to previous agenda items can turn meetings into a chaotic, confusing and laborious mess. Establish and enforce a clearly stated policy that, once the meeting has moved forward, previous discussions cannot be restarted. 6. Conclude optimistically with actionable tasks. Just as you started positively, also try to end the meeting on an upbeat, motivational note. Not every agenda item will require follow-up action, but many will. Identify those that do call for action and assign clear tasks to the appropriate attendees. Otherwise, dismiss everyone with a renewed sense of urgency to work on the items discussed. Contact us for more ideas on how to better accomplish your strategic objectives.